There is one migrant tale that I'm afraid made me chuckle. The tens of thousands of economic migrants forcing their way through Hungary and into Austria on their way to Baveria in Germany were single minded - but at the request of the German federal authorities, the Austrians had closed the official border crossing points. News crews were invited to film the closed roads. Tens of thousands of migrants took refuge in the forest on the border - only to find the trees annotated with scores of little arrows with German flags painted on them, pointing in the direction of Breitenberg in Bavaria. Within a week, ten thousand migrants had crossed the unguarded forest border into the town, away from the cameras. Of the hundreds of thousands of migrants passing through Austria this year, only about 46,000 have made asylum claims. Of those, a high proportion are from the western Balkans and will be sent home. Still, the upheaval is enough to worry the Viennese socialists, who have provided the Mayor and Council of Vienna pretty much since the 1920s, with the exception of 1938-1945. The right-of-centre Freedom Party is snapping at the socialists' heels, and tomorrow's vote could create a major upset the reverbrations of which will be felt in Berlin. Senior German politicians are furiously back-pedalling on Merkel's open invitation to the feckless of Africa, Asia and the Middle East to suckle at her German dugs. With Turkey getting revenge for Germany's repeated humiliation of the Moslem nation in blocking EU membership, Merkel now faces an influx of Syrian Jihadists, Islamists and rebels as Russia mops them up on the ground. In an article in Der Speigel, Merkel's refusal to talk numbers is reported to be splitting her support; " .. if her plan to pacify the world doesn't work, it could be that so many people will come to Germany that Germans will no longer stand for it. Merkel is aware of that, which is why she doesn't want to become involved in a discussion about numbers. She doesn't want to name her own threshold of failure." I've written before that there is a maximum number that Germany can take; clearly that number is less than the 1.5m that are headed there this year. When it comes to German border guards beating them back with batons and tear gas - as I think it will, whether under Merkel or her replacement - her great gesture will turn sour. 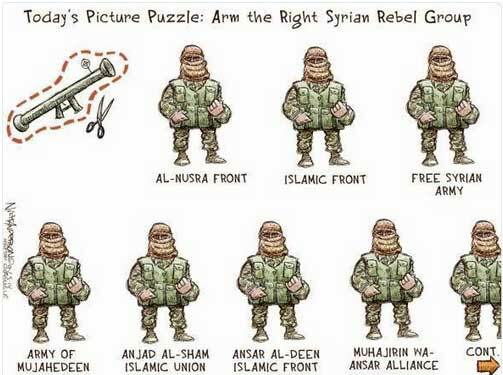 The cartoon below reflects more accurately than anything else the incestuous relationship between the Islamist rebel groups in Syria; the main US-backed group (and Calamity Dave's favourites) the 'Free Syrian Army' are undergoing all the classic stages of a US supported puppet in meltdown. Details of kidnap, torture and execution by the FSA documented by the United Nations. More defections to Islamist groups, and details emerge of close links to anti-Western Jihadists. Child soldiers recruited to counteract desertions. FSA asks CIA for more money. US advisors desperate to set-up little victory for FSA fighters to bolster waning support in Washington; CIA operatives engineer minor skirmish the FSA can't lose, with HD news crews in attendance. FSA screw it up and lose. Usually, Stage 5 is followed by the mass desertion of the rebel leadership with all the remaining funds and shots of happy ISIS fighters with a bonanza of new troops and equipment. They just don't learn from experience, do they? "Many of our neighbours look with satisfaction at our troubles and are prepared to extract favours in exchange for halting the flow of migrants. For us, refugees are specific people, individuals, who expect our help. For Turkey, however, the wave of refugees is just dirty business or a political bargaining chip. We are slowly becoming witnesses to the birth of a new form of political pressure, and some even call it a kind of a new hybrid war, in which migratory waves have become a tool, a weapon against neighbours. This requires particular sensitivity and responsibility on our side." He said "Wilkommen politik" had acted as a "magnet" for "millions" of Afghans and Pakistanis, and said Mrs Merkel needed to come up with serious solutions. It was a "beautiful moral gesture" but Mrs Merkel now faces an "exam in responsibility for the protection of the European political community and its external borders," he said. I am indebted to the truly excellent and regularly updated maps produced by IUC Analysts - rapidly available on the Pietervanostaeyen blog. 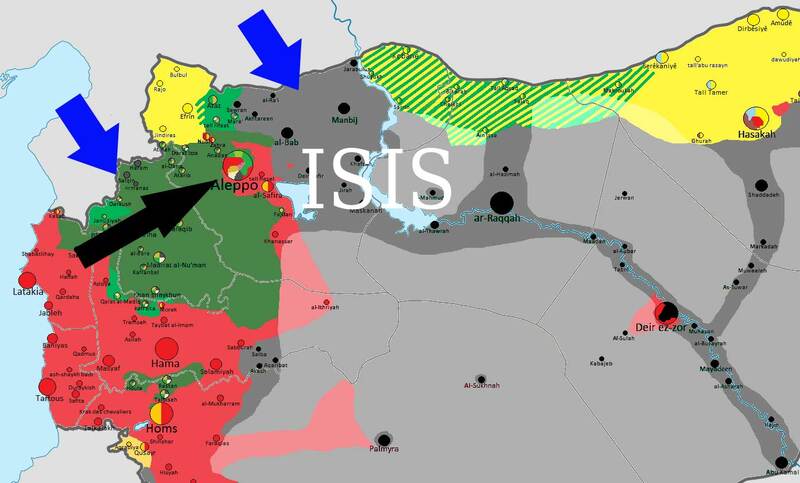 There are two gateways into Syria through Turkey; through the eastern one, ISIS receive arms, equipment, volunteers, supplies and goods, all with Turkish compliance. 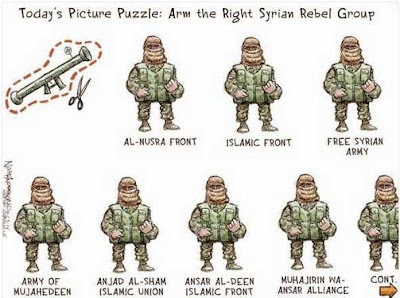 Through the Western, the US, French and Saudi supported rebels, including the al-quaeda murderers of Christians, al-Nusra, who hold a number of border towns including Harem, Salqin and Armanaz (clicky to see big - they're the dark grey) do the same. From the news reports, Russian air activity is aimed at a precursor to ground troops first closing the western of the border gateways. We must then rely on Russia to close the ISIS access to Turkey with the help of the Kurds (yellow on the map); encouraging the Kurds to take and occupy an in-depth zone right alomg the Turkish border will halt the terrorist supplies from the US, France, KSA and do more to bring peace to Syria than anything the UK has done. Make no mistake; Turkey and the KSA are our real enemies, and the real threats to peace. We need to pour money and troops into Greece to secure Europe's Eastern flank against Turkey, and give full support to Russia, Syria and the Kurds in blocking Turkey from the South. Only then will peace start to return to Iraq and Syria, and the tsunami of migrants into Europe actively facilitated by Turkey start to stem. Oh yes. We need to kick Turkey out of NATO. Meanwhile, Russian pilots flying straight line sorties from bases around Latakia to al-Nusra border strongholds are safe to do so until the US gets missile defences in place - when they'll have to start detouring southwards a smidgeon to avoid Turkish territory. I know it's not right, but you've got the grant the Kermits a measure of respect for their utter disregard of corporate guidelines on the inappropriate-touching thing and on maintaining an appropriate personal distance. Whilst in the UK we struggle to remember if it's OK to touch a woman's elbow or if anything above the wrist is a corporate no-go zone, or if you can squeeze a queer colleague's shoulder without being brought up on a disciplinary, the Kermits are never slow to display their wonderful uninhibited and tactile Kermitness. 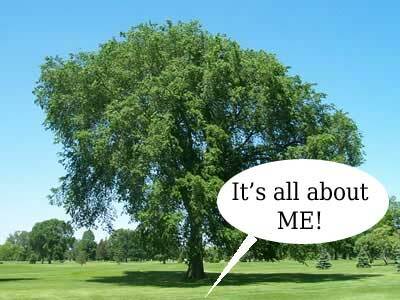 Most of the narcissists who will opt for such things are unlikely to pick, say, Scots Pines or Lombardy Poplars, skinny little trees, to mark their graves. No, they will want vast spreading Oaks, Elms and Chestnuts to ensure that even when dead they can deny the beneficial use of at least 150m2 of soil. That's the area under the canopy - the extent of a tree's feeding roots. An allotment holder can tell you what can be grown on such a 5-pole plot. The issue is that the beardy cereal-eaters constructing such schemes aren't from the Welsh mountains or Northumberland but Hoxton. And that they want to do this within the M25. Well, allow me to remind everyone of one of the capital's coming crises - the lack of burial space. Nearly all existing London cemeteries are reaching capacity. Unless we start turning our parks into burial grounds we must either (a) re-use old ones (b) bury people vertically in boreholes (c) cremate everyone (d) turn the green belt into a vast graveyard rather than farmland. The challenge for the future is how to deal with everyone's remains in the manner of their choosing. Moslems won't be burnt up and won't have coffins. Hindus prefer cremation on open-air funeral pyres but accept crematoria as a good alternative in places such as Southall. Zoroastrians would rather have their bodies laid on the top of the Canary Wharf towers and eaten by wild birds, but accept what they can get. And Hoxton hipsters need to be content with a bunch of wilting daffs above them rather than a vast Oak. There’s something especially sinister about the way our governments have followed a Wahhabi-led scheme to overthrow a secular dictatorship, a revolution that would almost certainly endanger Christians in the land of St Paul. Russia’s foreign policy is, no doubt, designed to serve Russia and those who rule Russia. But if it can bring an end to the war, and destroy ISIS, the al-Nusra Front and other militant groups, then Russia might just save Syria’s Christians and so fulfil the country’s historic promise to protect the region’s Christians.